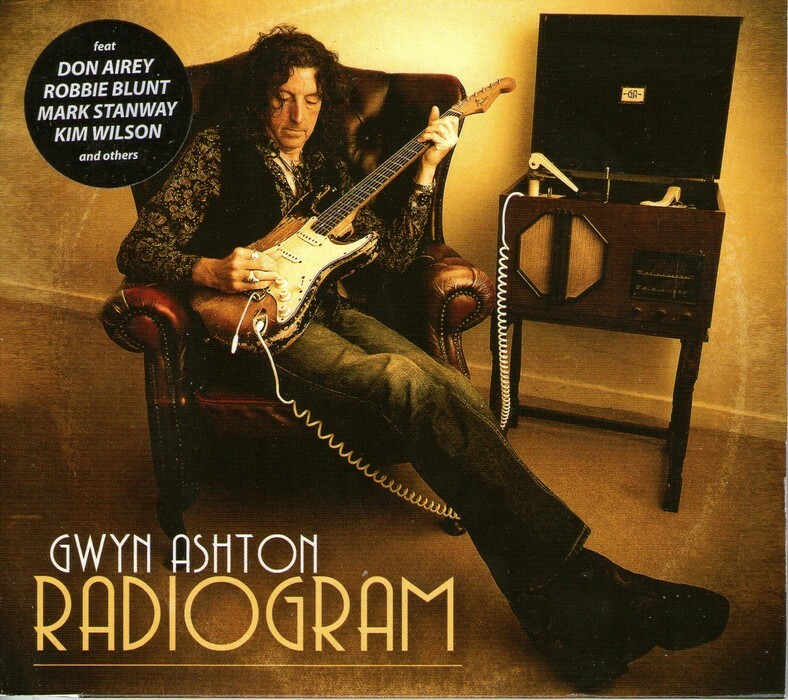 Singer-guitarist Gwyn Ashton follows last year’s rock epic Radiogram with a splendid little package. 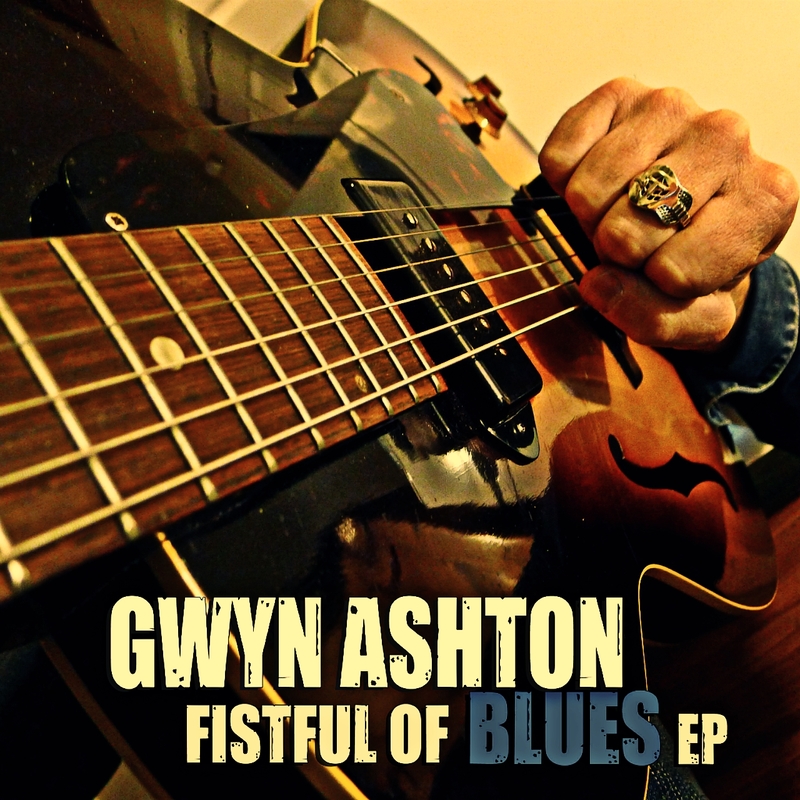 Fistful Of Blues, a four-song EP, explores blues rock from several angles, always with Ashton’s characteristic taste and nuance. “Take You Home Tonight” kicks off the program with style. A shuffle boogie taken at medium tempo, it’s played with such vigor that it feels like it’s accelerating. Ashton plays slide with assurance, here echoing his vocal line, there dazzling with cascades of notes during the breakdown section, wisely keeping the groove paramount. His tone, toppy on the single notes, grinds into throaty breakup on double-stops and chords. Thoughts of Rory Gallagher are certain to arise. “On The Borderline” sketches the story of a breakup over a sparse rhythm: one could drive a truck through the minimalist bass line and jazzy traps. The pace picks up, moving into a walking blues as the track progresses. Ashton dials in a snappy Strat tone and, squeezing out truly wild bends and spitting short bursts of notes, constructs a vivid solo that echoes Richard Thompson as much as it does Buddy Guy. “Waiting For The Day” is a rocker with effective dynamics in the music, and a lyric that moves from dark to defiant. Except in the choruses, which are played as a straight shuffle, the drumbeat maintains a martial feel. The solo is typically imaginative, with upper-register bent notes emerging like rays of light from tangled phrases and twanging low-end notes. No Blues Riffs 101 here: Ashton maintains an improbably high level of creativity. The minor-key love song “When You’re Alone” opens with a Univibed tone, moving easily into a haunting, subdued frame that works off the West Side blues riff patented by Magic Sam in his songs “Easy Baby” and “All Your Love.” The hushed, almost stately, verses make the guitar breaks stand out that much more. The middle solo opens quietly, with Ashton playing chunky phrases at low volume; he turns up for a hairier tone and a keener attack just before slipping back into another vocal verse. The watery, vibed guitar sound reappears as the music crescendos behind the vocal, and then–well, the outro solo is simply incredible. Ashton pulls tremolo picking, slides up and down the neck, rubbery bends, and more from his bag of tricks. All the while, the amplifier sounds as if it is melting down amid bomb bursts. It’s a harrowing performance. A palpable energy runs through the EP. The sessions feel like they were cut live, and the unadorned trio format yields plenty of space for Ashton’s voice and the instruments, which have a remarkable presence. The drum kit sounds fantastic, with the snare and cymbals right there, and the guitar jumps from the speakers. Even in its most florid moments, Ashton’s guitar playing is never gratuitous. Instead, it plays an essential role in developing the mood of these well-crafted songs. Fistful Of Blues is a fine set. Digital files for review were provided by the artist. The UK-based artist Gwyn Ashton remains inexplicably under-recognized in the United States, despite his success across Europe and his excellent recordings. His 2012 release Radiogram is a powerful set of songs that should find a home in the CD and mp3 players of every fan of honest, bluesy rock. Ashton and drummer Kev Hickman, with contributions from Don Airey (Hammond organ for Deep Purple, Rainbow, Whitesnake, and Black Sabbath) and Honeydrippers Mark Stanway (keyboards), Robbie Blunt (guitar), and Mo Birch (backing vocals), turn in a wide-ranging set. The riff behind “Little Girl,” a bone-cruncher in full AC/DC mode that features Ashton and guest Kim Wilson on harmonica, maintains the all-important swing that separates exciting rock from the soulless variety. “Let Me In,” a stylized boogie with Johnny Mastro on harp, bristles with barely-contained energy, threatening at several junctures to blow both speakers and amplifier alike. With chiming guitars, a gritty vocal, and impressive dynamic shifts, the mid-tempo rocker “Don’t Want To Fall” would, in a perfect world, dominate the airwaves in any decade: its melody line can certainly compete with anything Def Leppard ever cooked up. Pay special attention to the arrangement, which features unexpected touches like the George Harrison-inflected slide work that fills a brief, crucial space in the song. “I Just Wanna Make Love” recasts the Willie Dixon-penned Muddy Waters number “I Just Want To Make Love To You,” offering grooving, edge-of-meltdown guitar breaks that are perfect in a slightly Hendrix-inflected way. Sizzling tones on Ashton’s funky rhythm guitar keep the track really cooking. “Dog Eat Dog,” a grinding rocker laid over a shuffle beat, affords Ashton plenty of space to break out his bluesiest guitar lines, and he loads the cut with cutting fills and a snarling solo full of unrelenting attitude, groove, and surprising ideas. “For Your Love” splits the difference between “Dog” and “Love,” delivering mind-bending guitar lines over a spare, gritty slow grind. “Comin’ Home” is the pick hit here from a pop aspect (and who can’t appreciate a genuinely catchy number?). Ashton sings an irresistible melody over a track that develops from eighth-note guitar clicks (shades of The Cars!) to a chunky, Rolling Stones-like rhythm, filled out with solid slide and baritone guitar leads. It’s simply great. On the blues end, “Bluz For Roy” is Ashton’s splendid tribute to the late Telecaster genius Roy Buchanan. Raw-toned, with wildly bent notes, chicken-picking, volume knob swells, and other assorted hand-and-guitar-only effects, “Bluz” captures Buchanan’s creativity and spirit as well as anything I’ve heard. Hats off to Mr Ashton. On the relatively subdued “Fortunate Kind,” Ashton plays a Weissenborn lap steel, turning over lead guitar duties to the Robert Plant band veteran Robbie Blunt. The country-ish feel of the track lends it a flavor strongly reminiscent of The Band, with its tempo and driving drum part in particular recalling “The Weight.” That’s pretty good company. Along the same lines, you’ll want to pay particular attention to the ballad “Angel,” which serves almost as a continuation of Jimi Hendrix’s song of the same title by employing a similar tempo and melody. While the middle guitar break is evocative and emotional in its simplicity, the heat increases measurably on the extended ride-out solo as Ashton alternates legato and bitten-off phrases and makes masterful use of controlled feedback. The dynamics develop so naturally that when things quiet down again for a final, delicate exit, everything sounds perfectly right, and quite beautiful. How refreshing it is to be able to celebrate a hard rock album that adults can enjoy. That’s not meant to infer that Radiogram is enervated or predictable–quite the opposite. Nor, at the other end of the scale, is it pretentious or arty. It is just right: nothing here feels either tarted up or dumbed down. Gwyn Ashton’s music is thoughtful and complex when it needs to be, making good use of smart rhythms and splendid tones without seeming flash. And while he wears his influences on his sleeve, he never does so too conspicuously. All that qualifies as good music in my book. Consider that high praise, coming as it does from a listener who rarely programs this sort of music, but who appreciates it when it is done this well.